TAVI is first-line therapy in the treatment of patients with severe symptomatic AS and prohibitive or high surgical risk, and has an expanding role in the management of patients with progressively lower risk (including a 2017 American Heart Association/American College of Cardiology Class IIa indication for patients with intermediate surgical risk). In large part, the ability to rationally expand the use of TAVI (in place of surgical aortic valve replacement) to lower risk patients will rely on longer-term durability; if most lower-risk patients are younger, then 15- and 20-year durability will be of importance. Authors studied the Final 5-Year Clinical and Echocardiographic Results for Treatment of Severe Aortic Stenosis With a Self-Expanding Bioprosthesis From the ADVANCE Study, which was a global, prospective, nonrandomized, multicenter clinical study that enrolled “real-world” patients with symptomatic, severe AS suitable for TAVI. Patients were enrolled in 44 experienced centers in 12 countries; patient eligibility, treatment approach, and choice of anesthesia were determined by the local Heart Team comprised of at least one TAVI-experienced interventional cardiologist and one cardiothoracic surgeon. The study was 100% monitored, and adverse events were adjudicated by an independent clinical events committee using Valve Academic Research Consortium (VARC-1) criteria. The reserachers found that there were 1,015 patients enrolled with 996 attempted TAVI procedures. Mean age was 81 years, and mean logistic EuroSCORE was 19.3 ± 12.3%. Five-year follow-up was available on 465 (46.7%) patients. At 5 years, the rate of all-cause mortality was 50.7% (95% confidence interval, 46.7%-54.5%), and the rate of major stroke was 5.4%. Hemodynamic measures remained consistent for paired patients, with a mean aortic valve gradient of 8.8 ± 4.4 mm Hg (n = 198) and an effective orifice area of 1.7 ± 0.4 cm2 (n = 123). Aortic regurgitation (AR) decreased over time; among paired patients, moderate AR decreased from 12.8% to 8.0% at 5 years (n = 125). Of the 860 patients with echocardiographic data or a re-intervention after 30 days, there were 22 (2.6%) patients meeting VARC-2 criteria for valve dysfunction, and 10 (1.2%) patients with a re-intervention after >30 days. 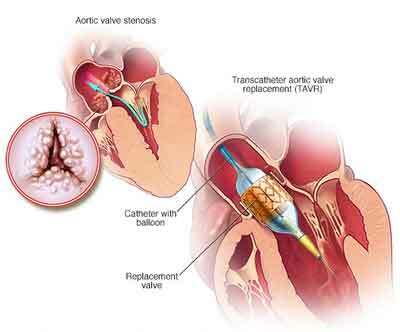 The authors concluded with this study that five-year results in “real-world” elderly high-risk patients undergoing TAVI with a self-expanding bioprosthesis provided evidence for continued valve durability, with low rates of re-intervention or hemodynamic valve dysfunction.